Lose It With Laser has the latest IPL technology in Melbourne to help you combat acne. Whether you have active acne or acne scarring, give acne prone skin a boost with our IPL skin treatments to attack the protein in the acne bacteria. 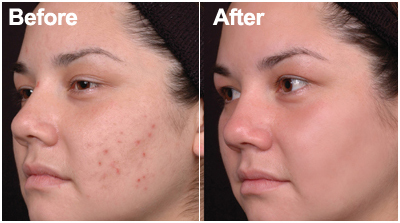 Acne lesions resolve fast and effectively once our treatment has commenced. Ongoing treatment may be necessary where condition is hormonal in nature. We know you will love the great results that will help you regain the confidence that you deserve to have. Acne is not a condition that only affects teenagers. Genetics, hormones at different stages of life, health, environment and stress can all lead to acne outbreaks. The severity can range from mild blackheads, which is essentially an opening in the skin that is filled with debris, bacteria and oil, to severe inflammation with cysts that form deeper in the skin. Acne can appear anywhere on the body but is mainly seen on the face, chest and back. Whilst the more severe type presenting with cystic acne will certainly benefit from a multi-treatment programme combining skincare specific to problematic skin, IPL acne treatments can certainly help to minimise the severity by slowing down the overall production of oil that results from increased sebaceous gland activity. The light targets the protein found in the bacteria associated with acne, thus controlling and minimising outbreaks. 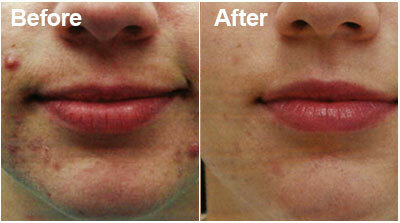 Results are excellent but the IPL acne treatment may need to be ongoing if the cause is hormonal in nature. IPL treatment for acne is recommended at 1-3 weekly intervals. Want to rid your skin of acne and its devastating effects on your appearance? Contact Lose It With Laser today on 0432 162 862 today to book an appointment for our IPL treatment for acne.